Published in the South Kent Gazette, 28 May, 1980. The persons who had acquired the Pent estate, proceeded forthwith to build upon it, and had put up sufficient property to bring in an annual ground rent of £50, when, in the year 1802, Mr Pitt, then the Lord Warden, proposed to increase the ground rents, and alter the system of leases, so as to make them terminable. This proposal not only brought all the old leaseholders up in arms, but the persons who had purchased Paradise pent ceased building. The agitation thus aroused resulted in a memorial from the lessees to the Harbour Commissioners, in August, 1803, in which they pleaded for a continuance of the existing system of leases, which was a ground rent at the rate of 2/6 in the pound on the annual rateable value, and the certainty of the renewal of leases, which had existed for two centuries and had given a security equal to freehold. The Commissioners neither assented to, nor dissented from, the views of the leaseholders; they suspended their judgment, the result being stagnation in building, and inability on the part of leaseholders to raise money on their property.. Mr Pitt resigned the Lord Wardenship immediately after making his proposal for altering the leases, and the new Lord Warden, Lord Hawkesbury, the Earl of Liverpool, hesitating to oppose his predecessor’s views, ten years passed before the business was definitely settled. In 1812, the Harbour Board decided that the old leaseholders should pay 3/6 instead of 2/6 in the pound on the annual rateable value, and that their leases should be terminable at the end of 61 years. As regards the lessees of Paradise pent, the ground rents remained at 2/6 in the pound, and the leases were granted for 99 years. Pending this settlement, the holders of Paradise pent, acting probably on some private assurance, had resumed building operations, so that, by the beginning of the year 1807, one whole street had been built; and, soon after, the remainder of the area was quickly covered with buildings. In this way, the Harbour Board secured a very considerable addition to their rent roll; but from a sanitary point of view, they blundered inexcusably by not spending some of the £3,522 they received for granting leases to raise the level of the ground. The whole area of the reclaimed Paradise pent land had, at the end of the 19th century become an insanitary area and the town council in 1895 purchased it with a view to improvement. The main street which, prior to the alterations made when the viaduct was built, crossed the area from the sea to Archcliffe, perpetuated the name of Lord Hawkesbury, who was then the Lord Warden; and the other main street, running from north to south, perpetuated the name of Sir Henry Oxenden, of Broome Park, one of the most active members of the Harbour Commission of his day. The third principal street of the area—Paradise Street—commemorated the name of the harbour from which the land was reclaimed —a name hastily given, and quite unwarranted by facts of history. 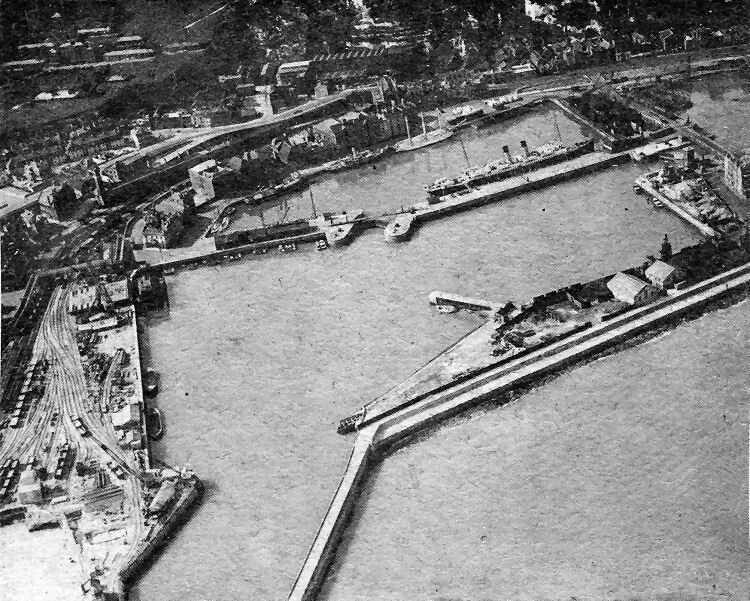 At first glance a modern aerial picture, this view is of the Granville Dock and tidal harbour at the time of the building of the train ferry dock — In the left hand corner — during the 1930s. 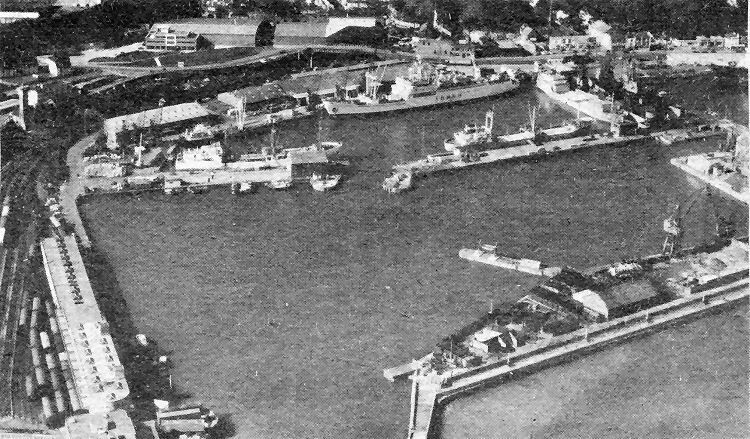 Compared with the 1970s view below, it gives a good idea of the many changes that have taken place in the western docks area in the past 40 years. On the left is the old harbour station, part of which still stands as shown in the other picture. Nearby is the old St. John’s Mariners’ Church and to the rear of Granville Dock, in a hollow below the cliffs, are the ill-fated oil mills or Commercial Buildings, now the site of Hammond’s offices and warehouses. Lying up against the Crosswall in the centre of the picture is the cross-Channel ferry Engadine which, as a seaplane carrier, launched an aircraft from which the pilot was said to have been the first to spot the position of the German fleet, leading to the famous Battle of Jutland. In fact the first sighting of the enemy was by the light cruiser Galatea. However, the Engadine did have the distinction of being the first ship ever to send up an aircraft in a naval engagement and of saving 675 men of the crippled cruiser Warrior before it sank.